Knitting Out in the World | Knit Like You Mean It. Hey! That old lady is knitting a guitar! Like any obsessed knitter, I perk right up when I see knitting in the Real World, whether it’s depicted positively or not. 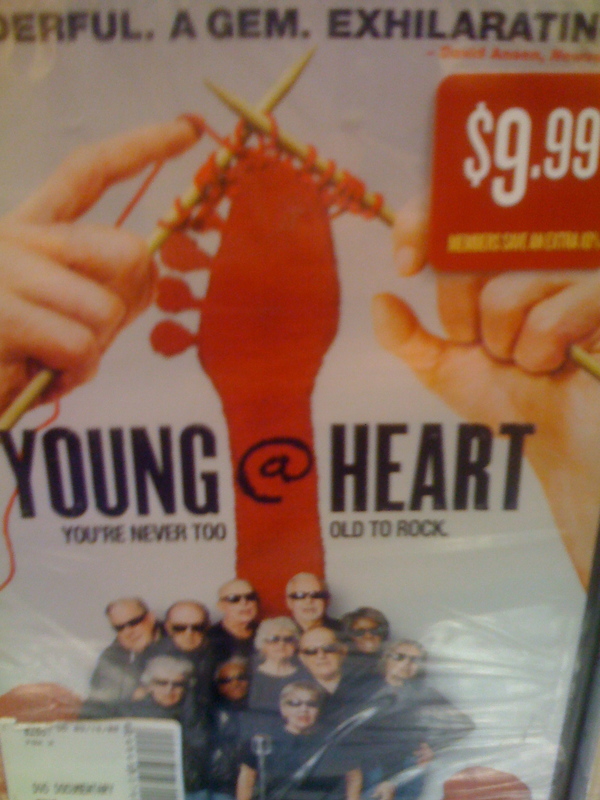 Therefore, when I saw this DVD cover for Young@Heart (apparently a documentary about a seniors’ chorus in Massachusetts that covers Jimi Hendrix and Coldplay), I snapped a shot, even though obviously knitting (“for old people”) is being contrasted with guitars (“for young people”). It’s so exhilarating that old people, who usually knit, can instead sing songs by Sonic Youth! Hurrah! Music has freed these sad old people from their knitting lives and released them to lead lives that have meaning! Or perhaps I am reading too much into it. I did take film classes in both undergrad and grad school. Those things can scar you for life. Hey! If that super-skinny girl can knit, maybe I can too! Now, see, this is more like it. She’s wearing a knit hat and she’s making…well, it’s some kind of square. Maybe she’s knitting for GarterStitch100, or the Red Scarf Project? Anyway, she’s knitting, and although she looks a leetle bit confused about how to insert the needle there, at least they’re trying. The Onion, now? The Onion is complex. They give us a genuinely funny comic about knitters here, and then they give us a fairly easy (read: low blow) image about crochet here. The only answer I can come up with is that there are knitters on The Onion staff…but they’re the kind of knitters who don’t like crocheters. What knitting have you seen out in the world lately? Share it with us! Did you think the comic about a knitting emergency kit was funny (or at least the “only brought the one pattern” mouse-over text?)? Do you think crochet is contributing to the grandmotherization of your neighborhood? Meanwhile, back at the ranch, we have a winner of the divine possum yarn: Consuela! Consuela is one of my students from Fiber Space, but I promise that the winner was once again chosen by the Random Number Generator. Consuela did get two extra entries into the drawing by knitting two squares for GarterStitch100; grab a ball out of your stash and try it yourself! Alchemy Wabi Sabi wants to come home with you. Comment on the blog for a chance to win! This week’s giveaway is six (that’s right, 6) skeins of Alchemy Wabi Sabi (rav lnk) in a gorgeous shade of orange called Joshua Tree. [Aside #2: I spent a lovely week rock-climbing in Joshua Tree National Park when I was a junior in high school. This may be why I bought the yarn in this color. I am nothing if not suggestible.] Purchased at Knit Happens in June, this yarn has lived in its plastic bag in our non-smoking, one-cat home ever since. 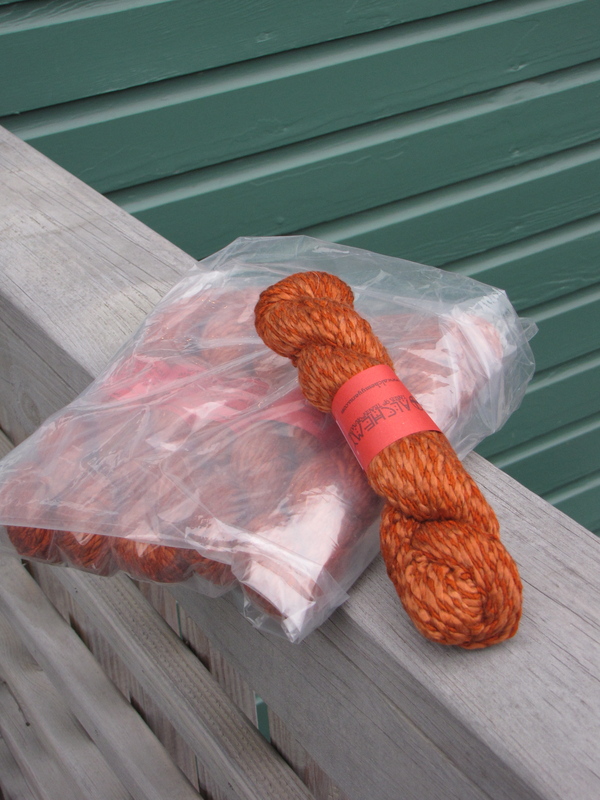 Comment on the blog between now and Tuesday, Feb. 14 for a chance to win this lovely yarn! As always, knit a square for GarterStitch100 and let me know about it and you’ll get an extra entry into the drawing. Well, my hiking there was 20 years ago, so we’re about the same, right? Boden is semi-cool I think. My kids wear Mini Boden! You heard it here first, folks – Cousin Melissa says Boden is semi-cool. Let there be much rejoicing! I found your blog while hunting for pastel hemp yarn in the UK – still not found it but I enjoyed reading your blog 🙂 Thank you. Thanks! I’d love a chance to win. Your hike must have been fun. Oh, that Onion comic! I need a copy on my wall. I’m delighted to see more and more younger people who knit, especially on Ravelry, in podcasts, etc. I’m going to Camp Kip in April, and it will be interesting to see the ages. I haven’t tried knitting or crocheting silk yarn yet, I’d love to try. Thanks for the chance! This yarn is gorgeous, thanks for the giveaway. I’ve never been one for hiking out in nature, but I can walk around a city for hours. Pretty, pretty yarn! Count me in for a GarterStitch100 square, too. Can’t find the size it needs to be…can you post? Thanks! Gorgeous yarn and am using some stash for the 6″ square (yes?) for th project GarterStitch is doing – nice chance to practice a pattern stitch. Those of you who are making squares can mail them to me here in the US by Feb. 23 or mail them straight to GarterStitch100 in Scotland by March 1. If you do the latter, just sent me a photo of your square(s) to get an extra entry into the drawing. Fun! So glad people are joining in on this. I found the comic amusing. I haven’t seen much knitting out in the world lately (but that might be because I spend most of my time either at home or at work lately). I see a lot of young people like myself crocheting these days. I was friends with some skater guys in college, and they learned to crochet so they could make themselves beanies to wear while skating. That Joshua Tree color is gorgeous… Joshua Tree reminds me of my grandparents-in-law. Welcome, Melissa! I love the image of skater guys crocheting.